When I finished planting some “cool weather” veggies—chard, beets, carrots, and lettuce—my tee-shirt was soaked. The simple reason was that the temperature last Wednesday was 89° F when I finished planting, and in the sun it felt like 99°. Cool-weather veggies, of course, refer to those that don’t mind cool, even crisp, nights and often bolt, or go to seed, when the really hot weather arrives. I suspect the seeds of the five veggies I planted today will have short-term memory loss and won’t recall the abnormally warm weather on the day I seeded them in one of our veggie plots. I planted two 3-foot rows of Ruby Red Swiss Chard, which should supply this household of two nicely through the summer and even into early winter. The chard won’t die back until the November or December temperatures drop into the 20s. And next to the chard I planted two short rows of Cylindra Beets. After these rows are up and growing, I’ll plant a couple more to get us through the summer. If I remember, I’ll plant even more rows in late summer to supply us through the fall months. Why did I choose Cylindra, rather than my customary Detroit Dark Red? Was I bored with the traditional globes and intrigued by the longer shape? I don’t have the slightest recollection. Let’s call it short-term memory loss. And I planted a single row, about 4’, of each Simpson’s Curled and Forellenschuss lettuce, and I’ll plant more as the season progresses so we will have a continuing supply. Simpson’s Curled is one of the popular loose-leaf types, but Forellenschuss? “It’s got my name in the middle of it,” wife Ellen said as she examined the Forellenschuss packet. Sure enough. And I noted later that the name also proclaims, “For Ellen.” Maybe there’s a good motto there: “Forellenschuss—as welcome as a dozen roses.” Why not give it a try? Second thought, that’s not a truly great idea. Simpson’s Curled is a dependable variety that we will enjoy in May and into June, maybe July. Forellenschuss is one of my “yearly experiments.” It captivated me when I saw it in the Seed Savers Exchange catalog. It’s an Austrian heirloom with medium-green leaves with splotches of maroon. The description on the packet explains the German: “Translates literally as ‘trout, self-enclosing,’ meaning it’s a speckled romaine.” Betcha the person who named it was also a fisherman. I think I won’t broadcast to friends that I’m raising “Self-Enclosing Trout lettuce, also called Forellenschuss.” Really, now, where does any conversation go after that announcement? Downhill, I guess, straight to the trout stream. Or to puzzled silence. And the carrot I planted is the traditional Chantenay, a medium length variety. Root veggies, such as carrots, of course, find it tough growing in heavy soils, such as our basic Howard County clay, but I’m hoping the soil I’ve improved over the last dozen years will yield some crunchy, sweet carrots. I should tie a string around a finger to remind me to keep the bed moist for the next couple of weeks, until the lettuces, then the chard, then the carrots and beets start reaching for the sun. Now I'm trying to imagine what a real trout would look like, self-enclosing. 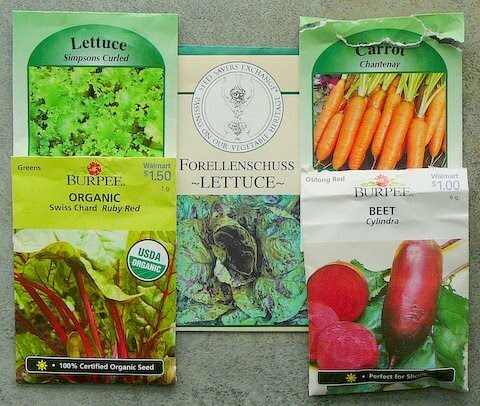 I grew Cylindra beets last year – because someone gave me the seed packet, a good enough reason. They were pretty tasty. Good luck with all your crops!